Recombinant full length protein corresponding to Human Alpha-synuclein aa 1 to the C-terminus. The epitope was mapped to amino acids 118-123 (VDPDNE). WB: Recombinant Human Alpha-synuclein protein (ab51189), HAP1 (WT), HAP1 (SNCA KO) whole cell lysate; Human brain whole cell lysate; Human brain tissue lysate. IHC-P: FFPE Human Normal Cerebral Cortex, FFPE Human Normal and Parkinson Substantia Nigra tissue. FLOW Cyt: Hap1-wt cells. Alpha-Synuclein is expressed predominantly in the brain, where it is concentrated in presynaptic nerve terminals. The deposition of the abundant presynaptic brain protein alpha-synuclein as fibrillary aggregates in neurons or glial cells is a hallmark lesion in a subset of neurodegenerative disorders. These disorders include Parkinson's disease (PD), dementia with Lewy bodies (DLB) and multiple system atrophy, collectively referred to as synucleinopathies. Parkinson's disease (PD) is a common neurodegenerative disorder characterized by the progressive accumulation in selected neurons of protein inclusions containing alpha-synuclein and ubiquitin. This antibody was developed with support from The Michael J. Fox Foundation, in collaboration with the laboratory of Dr. Michael Schlossmacher (University of Ottawa). Our Abpromise guarantee covers the use of ab138501 in the following tested applications. WB 1/10000. Predicted molecular weight: 14 kDa. IHC-P 1/150. Perform heat mediated antigen retrieval before commencing with IHC staining protocol. For unpurified use at 1/15 to 1/300. For unpurified use at 1/20. Lanes 1 - 4: Merged signal (red and green). Green - ab138501 observed at 14 kDa. Red - loading control, ab8245, observed at 37 kDa. ab138501 was shown to specifically react with SNCA in wild-type HAP1 cells. No band was observed when SNCA knockout samples were used. Wild-type and SNCA knockout samples were subjected to SDS-PAGE. Ab138501 and ab8245 (Mouse anti GAPDH loading control) were incubated overnight at 4°C at 1/10000 and 1/10000 dilution respectively. Blots were developed with Goat anti-Rabbit IgG H&L (IRDye® 800CW) preabsorbed ab216773 and Goat anti-Mouse IgG H&L (IRDye® 680RD) preabsorbed ab216776 secondary antibodies at 1/10000 dilution for 1 hour at room temperature before imaging. IHC image of alpha Synuclein staining in normal Human cerebral cortex formalin fixed paraffin embedded tissue section, performed on a Leica Bond™ system using the standard protocol F. The section was pre-treated using heat mediated antigen retrieval with sodium citrate buffer (pH6, epitope retrieval solution 1) for 20 mins. The section was then incubated with ab138501, 5µg/ml, for 15 mins at room temperature and detected using an HRP conjugated compact polymer system. DAB was used as the chromogen. The section was then counterstained with haematoxylin and mounted with DPX. Immunocytochemistry/Immunofluorescence analysis of U87-MG (Human glioblastoma-astrocytoma epithelial cell line) cells labeling alpha Synuclein with purified ab138501 at 1/150 dilution (left panel). Cells were fixed with 4% paraformaldehyde. A Goat anti rabbit IgG(Alexa Fluor®555) (1/200) was used as the secondary antibody. DAPI (blue) was used as the nuclear counter stain (right panel). Overlay histogram showing HAP1 wildtype (green line) and HAP1-SNCA knockout cells (red line) stained with ab138501. The cells were fixed with 80% methanol (5 min) and then permeabilized with 0.1% PBS-Triton X-100 for 15 min. The cells were then incubated in 1x PBS / 10% normal goat serum to block non-specific protein-protein interactions followed by the antibody (ab138501, 1µg/ml) for 30 min at 22°C. The secondary antibody used was Alexa Fluor® 488 goat anti-rabbit IgG (H&L) presorbed (ab150081) at 1/2000 dilution for 30 min at 22°C. A rabbit IgG isotype control antibody (ab172730) was used at the same concentration and conditions as the primary antibody (HAP1 wildtype - black line, HAP1-SNCA knockout - grey line). Unlabelled sample was also used as a control (this line is not shown for the purpose of simplicity). Flow cytometry analysis of 2% paraformaldehyde fixed HeLa (Human epithelial cells from cervix adenocarcinoma) cells labeling alpha Synuclein with purified ab138501 at 1/200 dilution. The secondary antibody was Goat anti rabbit IgG (FITC) at 1/150 dilution. The Isotype control is Rabbit monoclonal IgG (green line). IHC image of alpha Synuclein staining in Normal human Substantia Nigra formalin fixed paraffin embedded tissue section, performed on a Leica Bond™ system using the standard protocol F. The section was pre-treated using heat mediated antigen retrieval with sodium citrate buffer (pH6, epitope retrieval solution 1) for 20 mins. The section was then incubated with ab138501, 5µg/ml, for 15 mins at room temperature and detected using an HRP conjugated compact polymer system. DAB was used as the chromogen. The section was then counterstained with haematoxylin and mounted with DPX. Immunocytochemistry/Immunofluorescence analysis of U87-MG (Human glioblastoma-astrocytoma epithelial cell line) cells labeling alpha Synuclein with unpurified ab138501 at 1/15 dilution (left panel). Cells were fixed with 4% paraformaldehyde. A Goat anti rabbit IgG(Alexa Fluor®555) (1/200) was used as the secondary antibody. DAPI (blue) was used as the nuclear counter stain (right panel). Observed band size: 18 kDa why is the actual band size different from the predicted? IHC image of alpha Synuclein staining in Parkinson Human Substantia Nigra formalin fixed paraffin embedded tissue section*, performed on a Leica Bond™ system using the standard protocol F. The section was pre-treated using heat mediated antigen retrieval with sodium citrate buffer (pH6, epitope retrieval solution 1) for 20 mins. The section was then incubated with ab138501, 5µg/ml, for 15 mins at room temperature and detected using an HRP conjugated compact polymer system. DAB was used as the chromogen. The section was then counterstained with haematoxylin and mounted with DPX. 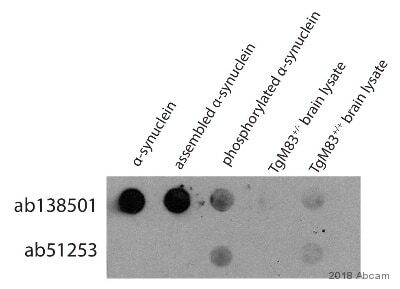 alpha Synuclein was immunoprecipitated from Human fetal brain tissue using purified ab138501 at 1/600 dilution. Western blot was performed from the immunoprecipitate using purified ab138501. Goat Anti-Rabbit IgG, (H+L), Peroxidase conjugated was used as secondary antibody at 1/1000 dilution. Blocking and dilution buffer and concentration: 5% NFDM/TBST. Immunohistochemistry (Formalin/PFA-fixed paraffin-embedded sections) analysis of Human clear cell carcinoma of kidney labeling alpha Synuclein with purified ab138501 at 1/150 dilution. Heat mediated antigen retrieval was performed using Tris/EDTA buffer pH 9. Prediluted HRP Polymer for Rabbit IgG was used as the secondary antibody. Counter stained with Hematoxylin. 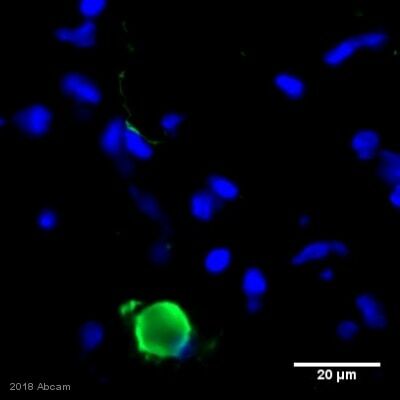 Immunohistochemistry (Formalin/PFA-fixed paraffin-embedded sections) analysis of Human clear cell carcinoma of kidney labeling alpha Synuclein with unpurified ab138501 at 1/15 dilution. Heat mediated antigen retrieval was performed using Tris/EDTA buffer pH 9. Prediluted HRP Polymer for Rabbit IgG was used as the secondary antibody. Counter stained with Hematoxylin. Immunohistochemistry (Formalin/PFA-fixed paraffin-embedded sections) analysis of Human brain tissue labeling alpha Synuclein with unpurified ab138501 at 1/300 dilution. Flow cytometry analysis of 2% paraformaldehyde fixed HeLa (Human epithelial cells from cervix adenocarcinoma) cells labeling alpha Synuclein with unpurified ab138501 at 1/20 dilution. The secondary antibody was Goat anti rabbit IgG (FITC) at 1/150 dilution. Publishing research using ab138501? Please let us know so that we can cite the reference in this datasheet.